I am just a grand-mother with a love of Volkswagens. I've wanted to have a beetle of my own ever since I learned to drive. I've had 3 in my life time. I now drive a New Beetle and I absolutely love it. I try to participate as often as my busy lifestyle permits in VW related events. The one that my husband I have been volunteering at is the Great Canadian Bug Show in Toronto that takes place every summer. We like to be at the front gate to take in entries and get to see all the participants as they come in. This is one sure way of making sure that you do get to see all of the entrants. I do not know what else I can say that I do at the moment. Oh Yeah! I sell Volkswagen Beetle paraphernalia on an auction site called eBay. If you are interested in seeing some of the stuff that I sell just surf on in to: http://members.ebay.com/aboutme/roxxxxy/ this is an "about me" page that I maintain. I try and change the content ever so often and put stuff that is of course Beetle related. 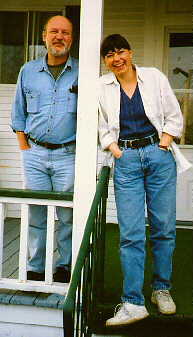 If you are interested in seeing some of the fun things I do with my friends in my New Beetle then you can just check this site out... http://www.geocities.com/MotorCity/Garage/1977/nbowners/nbownerroxane.htm If you would like to see some (and more added daily) of the photos of Volkswagen Beetles that I've taken pictures of then just look this site up... www.clubphoto.com enter my e-mail address (roxanebay@sympatico.ca) and look up the title "Volkswagen Beetles & Related". Roxane told me the following, attending to the QUEST: -"I do have on my website an interesting item that was given to me by a dear friend. If you wish to use it you may. 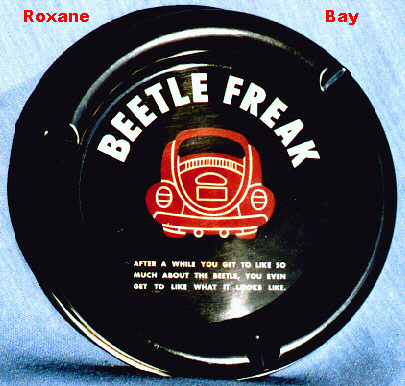 It is an ashtray which reads: Beetle Freak." I looked carefully and could read the rest of the inscription, that says: "After a while you get to like so much about the Beetle even get to like what it looks like".